Fuel prices can be viewed as an interactive Map layer as well as within an FBO directory listing. ForeFlight Directory List view shown on the Maps view. Turn on the “Fuel: 100LL” layer and tap on a marker to view FBO details. The price that is shown on the Fuel: 100LL layer in the Maps view and on the FBO List view (found by tapping the FBOs button in the Airport view or by tapping on a marker in the Maps view) is a summary of the lowest price options. An FBO that sells both full-service and self-serve 100LL will likely have two different prices. Tap on the business listing to reveal more information and ensure you are viewing all available 100LL fuel prices. 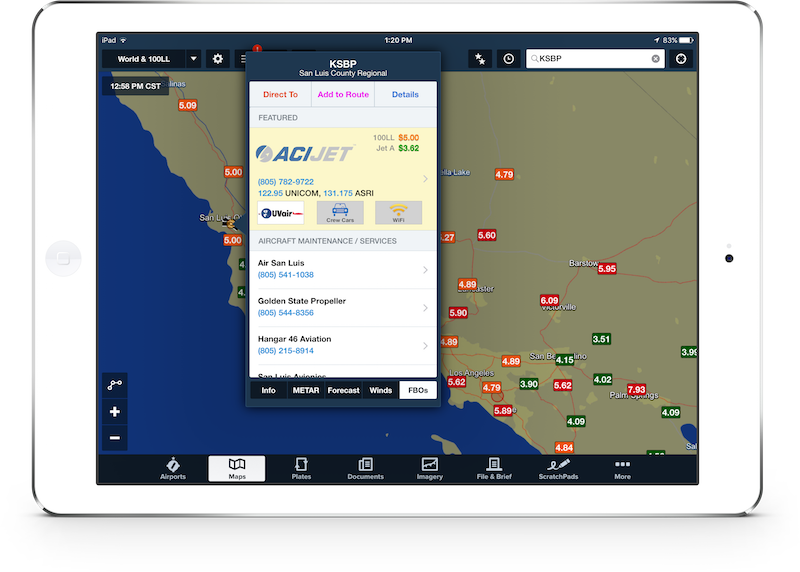 In this example, tap directly on the ACI Jet listing to reveal more FBO details and all available retail fuel prices they offer. We actively partner with FBOs to help them keep their listing information and fuel prices up-to-date. However, if you find the price you pay at the pump is different from our last update, you can help update the price right through the app. To submit fuel price updates, from the Airport view, tap FBOs, then tap on the FBO of choice. On the lower right corner, tap Update Fuel Prices. Enter the current price and tap Submit. The ACI Jet detail view is shown here in the Airports view. The airport Comment and FBOs buttons are highlighted in the upper right. The Add Comment and Update Fuel Prices buttons specifically for ACI Jet are highlighted at the bottom of the listing window. Many businesses add a custom description, tappable links to their website and social media, photos, affiliate service badges, and company logo. The Business Directory is rich with data and images to help pilots and trip planners make more informed decisions. 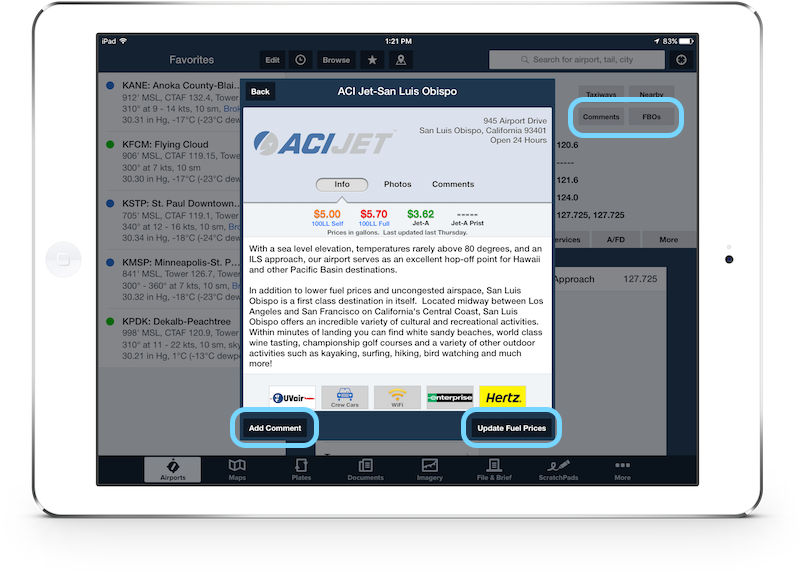 ForeFlight customers can submit two kinds of comments: feedback on the airport in general and feedback on the specific business they visited. We hope you have a great experience to share with fellow pilots, however if there is an issue we encourage you to contact the FBO or other business directly first to resolve the situation. Comments are published unedited (with the exception of gate codes and special fuel prices) and identify you as the commenter using the part of your email address that is before the “@” sign. Notice there are two areas within the Airport Comments section: Remarks and Comments. Remarks are official Airport Remarks published by the airport manager or sponsor through the FAA. Comments are submitted by ForeFlight subscribers and are based on the subscriber’s personal experience at that airport. We have received lots of positive feedback on our FBOs on Taxi Charts feature. Fuel seller locations are mapped with an interactive marker right on the taxi chart. Tap on the FBO button in the upper left area of the taxi chart to turn the markers on and off. Tap the marker to see information about the FBO without leaving the chart view. FBOs on Taxi Charts makes FBOs easy to find after the pilot lands. All of the Directory listing details are available right on the taxi chart view. Questions about ForeFlight Directory? I’d love to hear from you! I’m on frequency at directory@foreflight.com. This entry was posted in 2016 ForeFlight Year in Review, ForeFlight Mobile and tagged aviation, flight planning, foreflight, iPad by Linda Street-Ely. Bookmark the permalink.